Beta-glucan is a natural polymer with a fiber-like structure, produced by joining together a large number of glucose molecules. It is said to have “tremendous health-promoting applications” . This polymer can be obtained from many sources, among them cereals, seaweeds and fungi, but the molecules produced in each organism slightly differ . However, it is known that glucans of large mass and triple helix structure are the most biologically active, and this type of glucan is produced in yeast . In addition, the structure of this glucan is also specially adapted, producing a heavy, but water-soluble polymer that strongly activates the biological response . 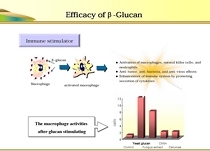 The areas where beta-glucan is used are activating the immune system, fighting bacteria and other infectious agents, reducing tumor growth and others. It even has an inhibitory effect on adipocytes, the fat-storing cells . In recent years, skincare researchers have been developing new uses for this component as well. 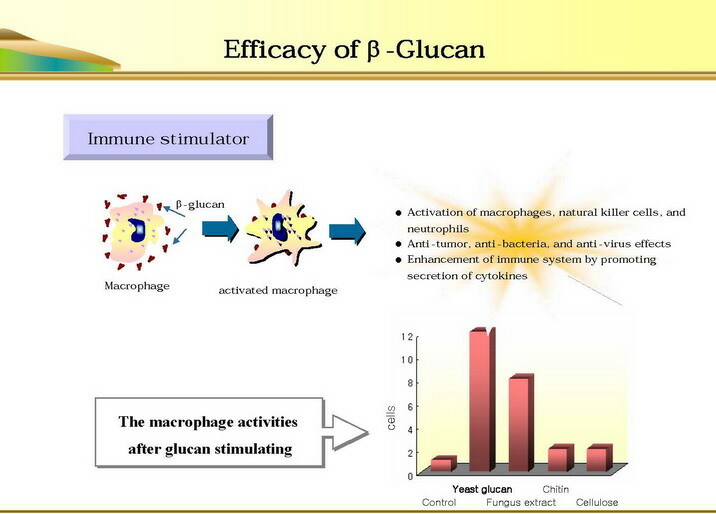 Beta-glucan is very useful in wound care. It stimulates regeneration of the epithelium, improves collagen deposition, and helps attract the cells of immune system to the wound site . In skin cell experiments, addition of yeast beta-glucan resulted in faster repair of the damage site and regrowth of the outer layer of skin , . It was shown to effectively enhance wound closure in diabetic animals – this condition causes impaired wound healing, so addition of supporting agents is particularly required . Beta-glucan applications are also useful in treating burn wounds, since the polymer is able to protect the tissue from oxidative damage . Combined with a collagen matrix, beta-glucan is already used to treat human wounds in clinical care, resulting in less pain, improved healing, and better scar appearance . Since the immune response is enhanced by fungal glucan, it supports the natural defenses against bacteria and other infections . This is also useful in wound care, for example, glucan may be used in combination with antibiotics to prevent wound infections by Staphylococcus . The antioxidant properties of beta-glucan are also utilised in anti-ageing and sunscreen applications. This polymer can reduce the oxidative damage from various sources, including chemicals and UV. Glucan from yeast is the most studied in this respect, with many experiments confirming its effectivenes, and even the ability to restore the functions of other antioxidants . For example, applying 0.2 % glucan-containing emulsion for only 5 days was enough to completely protect certain skin molecules from the effects of UV irradiation . A similar beta-glucan from another species of fungus was found to reduce various aspects of UV damage. Namely, in irradiated mouse the polymer decreased the amounts of inflammatory signals and collagen-degrading enzymes, protected the keratinocytes (skin cells) from cell death, and restored normal levels of natural antioxidants . 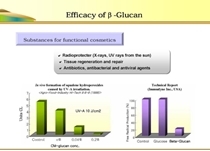 Treatment of skin with beta-glucan can also improve its barrier function. Volunteer skin, pre-treated with glucan-containing cream (0.04 to 0.4 % concentrations) for 2 weeks, showed significant resistance to damage from a detergent, measured by a reduced water loss . This is also useful in treating aged skin symptoms. In addition, this polymer also improves aged skin appearance by other mechanisms: fungal glucan can increase collagen content, cell proliferation, reduce sunburn, and prevent melanin formation and thus darkening of the skin . B. Du, Z. Bian, and B. Xu, “Skin Health Promotion Effects of Natural Beta-Glucan Derived from Cereals and Microorganisms: A Review,” Phytother. Res., vol. 28, no. 2, pp. 159–166, Feb. 2014. D. B. Zeković, S. Kwiatkowski, M. M. Vrvić, D. Jakovljević, and C. A. Moran, “Natural and Modified (1→3)-β-D-Glucans in Health Promotion and Disease Alleviation,” Crit. Rev. Biotechnol., vol. 25, no. 4, pp. 205–230, Jan. 2005. D. J. Manners, A. J. Masson, and J. C. Patterson, “The structure of a β-(1→3)-d-glucan from yeast cell walls,” Biochem. J., vol. 135, no. 1, pp. 19–30, Sep. 1973. Vetvicka, V. and Vetvickova, J., “β(1-3)-D-glucan affects adipogenesis, wound healing and inflammation,” Orient. Pharm. Exp. Med., vol. 11, no. 3, pp. 169–175, Sep. 2011. F. Zulli, F. Suter, H. Biltz, and H. P. Nissen, “Improving skin function with CM-glucan, a biological response modifier from yeast,” Int. J. Cosmet. Sci., vol. 20, no. 2, pp. 79–86, Apr. 1998. M. Berdal, H. I. Appelbom, J. H. Eikrem, Å. Lund, S. Zykova, L.-T. Busund, R. Seljelid, and T. Jenssen, “Aminated β-1,3-d-glucan improves wound healing in diabetic db/db mice,” Wound Repair Regen., vol. 15, no. 6, pp. 825–832, Nov. 2007. H. Z. Toklu, G. Sener, N. Jahovic, B. Uslu, S. Arbak, and B. C. Yeğen, “beta-glucan protects against burn-induced oxidative organ damage in rats,” Int. Immunopharmacol., vol. 6, no. 2, pp. 156–169, Feb. 2006. S. J. Delatte, J. Evans, A. Hebra, W. Adamson, H. B. Othersen, and E. P. Tagge, “Effectiveness of beta-glucan collagen for treatment of partial-thickness burns in children,” J. Pediatr. Surg., vol. 36, no. 1, pp. 113–118, Jan. 2001. G. D. Brown and S. Gordon, “Fungal β-Glucans and Mammalian Immunity,” Immunity, vol. 19, no. 3, pp. 311–315, Sep. 2003. A. B. Kaiser and D. S. Kernodle, “Synergism between poly-(1-6)-beta-D-glucopyranosyl-(1-3)-beta-D-glucopyranose glucan and cefazolin in prophylaxis of staphylococcal wound infection in a guinea pig model,” Antimicrob. Agents Chemother., vol. 42, no. 9, pp. 2449–2451, Sep. 1998. K. H. Kim, S. J. Park, Y. J. Lee, J. E. Lee, C. H. Song, S. H. Choi, S. K. Ku, and S. J. Kang, “Inhibition of UVB-induced skin damage by exopolymers from Aureobasidium pullulans SM-2001 in hairless mice,” Basic Clin. Pharmacol. Toxicol., vol. 116, no. 2, pp. 73–86, Feb. 2015.